Ozarks, history, fun and adventure at The Shepherd of the Hills! 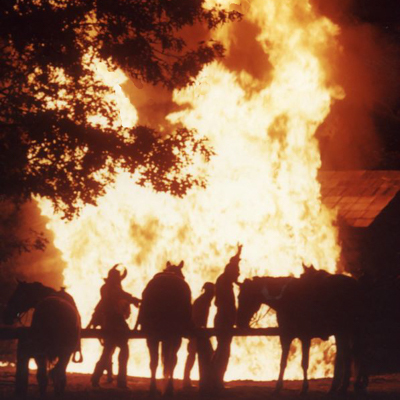 Scene from the “Shepherd of the Hills Outdoor Drama” with the burning of the cabin. Notice the outline of the distinctive Balknobbers’ masks. Harold Bell Wright’s bestselling 1907 novel, “The Shepherd of the Hills,” about love, forgiveness, and life in the late 1800’s Ozarks was the real beginning of tourism in the Branson area. Since the publishing of the novel, the Shepherd of the Hills Homestead and its surrounding environs, where Wright wrote his novel and whose people and life it was about, has been bringing tourists to the Ozarks and Branson. It was made even more so when the spectacular outdoor production, The Shepherd of the Hills Outdoor Drama started performing in the Ole Mill Theatre in a hollow on the Homestead in 1960. The drama presents Wright’s novel in an exciting action packed production with a cast of more than 90 performers; dozens of animals including, horses, donkeys, mules, and sheep presented in an outdoor amphitheater, covered by the stars, and surrounded by the very hills Wright wrote about. This legendary tale of love, Ozarks life and heritage is something that inspires as it entertains and will be remembered for a lifetime. The Shepherd of the Hills Historic Homestead Tour: A fantastic daytime activity touring the historic Homestead and set where one of Branson’s favorite nighttime shows happens! The tour sets the stage for the outdoor drama, The Shepherd of the Hills, and gives you a behind-the-scenes glimpse into this legendary production and much more. You’ll take a tram across the trail of the homestead with an experienced guide, learning interesting details about a number of different landmarks, including Old Matt’s Cabin, the original home of the story’s main characters. It visits Inspiration Point, the site is where Wright compiled the notes for his book, and see statues of the key characters in the story and a monument honoring Harold Bell Wright, the author of ” The Shepherd of the Hills.” The tour includes visits to the site of Old Matt’s Grist Mill, where the “Old Mill Theatre” was carved into its wooded setting, as well as a visit to Jenning’s Still for an authentic, and comical, look into the lost art of making moonshine! The Shepherd of the Hills Historic Homestead Tour is a great way to set the stage for seeing the spectacular outdoor production of The Shepherd of the Hills Outdoor Play and discover a bit about the historical past of the Ozark’s hill folk of the Branson Area. Shepherd with the Hills ATV Adventures: An ATV experience like no other, with two different “adventures” from which to saelect. 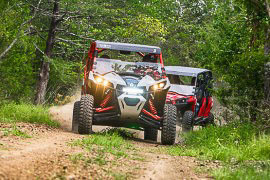 Beginners to ATV’s can take a single hour excursion. The first 30 minutes includes instruction, tips, and practice on how to operate the ATV on pavement. The last 30 minutes is fun and adventure into the backwoods trails of the Homestead. If one hour’s not enough there is an hour and a half excursion including one “hour of deep off-roading that’ll make the hair on the back of your neck stand on end.” All the off road trail rides, excursions, are a guided and led by Shepherd of the Hills staff. Shepherd of the Hills Inspiration Tower: This iconic tower is 230 feet tall and sits on top of an Ozarks’ mountain high above beautiful Ozarks scenery and Branson. Constructed in 1989 to celebrate the 100th anniversary of famed author, Harold Bell Wright, the impressive structure incorporates more than 92,000 pounds of steel, can withstand a continual wind of 172 miles per hour or gusts of up to 224 miles per hour and includes more than 4,400 square feet of glass; enough to cover a third of a football field. A glass elevator takes you up to the spacious, enclosed observation deck where you will see panoramic views that’ll leave you breathless! In any season, the view is spectacular, but there’s just something extra special about the spring and fall. On clear days you can see over 90 miles away! Its ground floor has a great gift shop filled with souvenirs and handy travel items, to a snack bar, and restrooms. Shepherd of the Hills Adventure Park’s Rope Course. 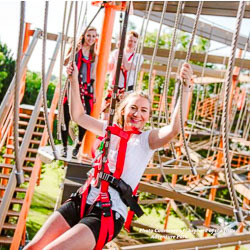 The Shepherd of the Hills Adventure Park features a Zipline Canopy Tour, Rope Course, and Lil Pete’s Playland. They offer a choice of fun and adventure for every member of the family. For more information on all the fun, excitement, adventure, and entertainment that the Shepherd of the Hills offers or any of Branson’s other shows and attractions, or for lodging arrangements, please contact the Branson Tourism Center (BTC), one of Branson’s largest and most respected vacation planning services. BTC has sold over 5 million Branson show and attraction tickets; is proudly located in Branson, and is a BBB A+ accredited business. It and may be contacted by calling 1-800-785-1550 or visiting www.BransonTourismCenter.com. This entry was posted in Attractions, Branson, Featured, Shows on August 15, 2018 by Gary Groman. The Erwins, just one of the amazing groups performing for SDC’s South Gospel Picnic; The Haygoods; Branson Fiddle Festival, and Daniel O’Donnell. August brings the winding down of family summer activities and the start of school, but there’s still time for one more family “summer fling,” and what better place to do it than in Branson, Missouri! Day in and Day out, Branson offers a choice of exciting live entertainment, attractions, natural beauty, shopping, and exciting things to do that few, if any, travel destinations can equal. BTC’s Best Branson Insider Highlights, for August of 2018, highlights performances and major events taking place during the month of August that are in addition to everything else that Branson offers on a daily basis. They are listed by category, sorted in order of starting date, and are preceded by our “Featured” Show, Limited Engagement, and Event of the Month, as appropriate. Featured Show of the Month: The Haygoods are celebrating their 26th year of entertaining Branson Audiences in 2018 and there’s good reason for it. From the beginning to the end, it’s an exciting musical “adventure’ for the family to share together. An adventure filling the senses with great music, energy, excitement, color, and action, the likes of which will not be seen on any other Branson stage. Whether it’s back flips, fire canons, high-energy mountain tap dancing, or something else, you’re always anticipating what’s coming next as they entertain both children and adults, simultaneously and to similar levels of enjoyment. If you are looking for a show with great music, excitement, action, special effects, and energy that will entertain the whole family, then The Haygoods is the show for you! Featured Limited Engagement of the Month: Although there are no Limited Engagements scheduled for August, this gives us a chance to share that Daniel O’Donnell will present his Christmas With Daniel at the Welk Resort Theatre during the Christmas season. He will be performing only 20 shows between November 1 and December 1, 2018. Although Daniel has been performing Limited Engagements in Branson for years, this will be a first with his Christmas show. With the limited number of performances, the interest in his new Branson Christmas show, and the way many of Daniel’s shows sell out in advance, it is suggested that those wanting to see his show make advance reservations to ensure both availability and the best seating. Featured Event of the Month: Branson’s 30th Annual Fiddle Festival & Mid-America Fiddlers Championship will be held at the Grand Country Water Park Resort, August 24-26. The fun starts in the Grand Country Parking Lot at 6:30 PM on August 24 with the “Anything Goes Contest” and a free concert starring Melody Hart and a live band. The Mid-America Fiddlers Championship starts on the morning of August 25. Six Divisions, from Pee-Wee to Senior and Open, will compete for thousands of dollars in prizes and the coveted title of the “Mid-America Fiddle Champion.” The title will be decided in a Round Robin Play Off at 4:00 PM on August 26. The actual competition will be conducted in the Grand Country Music Hall, the home of all Grand Country’s shows, and will be hosted by noted Branson Fiddler Wayne Massengale. For more information, tickets or reservations on these or other Branson shows, attractions or lodging please contact the Branson Tourism Center, one of Branson’s largest and most respected vacation planning services and sellers of almost 5 million Branson show and attraction tickets by calling 1-800-785-1550 or through their website www.BransonTourismCenter.com. This entry was posted in Attractions, Branson Events, Branson Shows, Featured on July 31, 2018 by Gary Groman. What’s an ideal family day in Branson? “Amazing Pets!” is a great way for a family to start an ideal day in Branson! For many, “an ideal family day in Branson would be one where the whole family had fun and made great memories together.” The great news is that with all the live shows, attractions, shopping, and other things that Branson has to see and do that’s not hard to have happen, but what would an ideal family day in Branson consist of, in terms of activities for the whole family to enjoy together? There obviously is no one right answer because of the variables that could come into play such as weather, age of children, budget limitations, etc. Although there’s many different ways to plan an ideal family day in Branson, here’s one approach; dividing the day into three time periods Morning, Afternoon, and Evening with suggestions for an Attraction and one or more Shows for each time period. Show: Amazing Pets features dogs, cats, and beautiful flying birds delighting the audience with their performance. 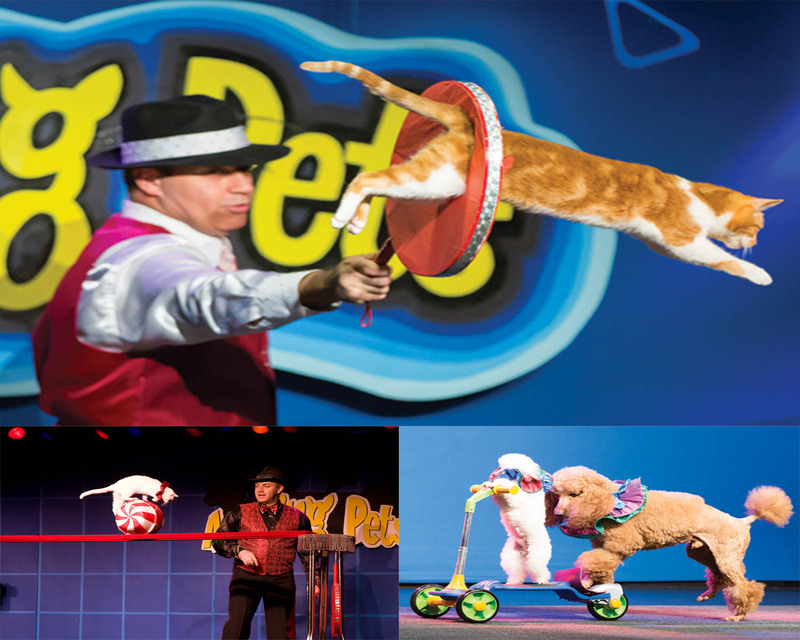 Trainer Valery Tsoraev has combined the antics of his well-trained cats and dogs, with costuming, and choreography into a unique unbeatable entertainment experience that kids, as well as the adults who brought them, just love. The interaction between the show’s host, the affable “Apple Jack,” played “from the heart” by Shannon Thomason, and the audience is filled with fun and keeps things moving along between the animal acts. It’s a show made even more special because over 80% of the dogs and cats in it were recused by Valery and his family from shelters. 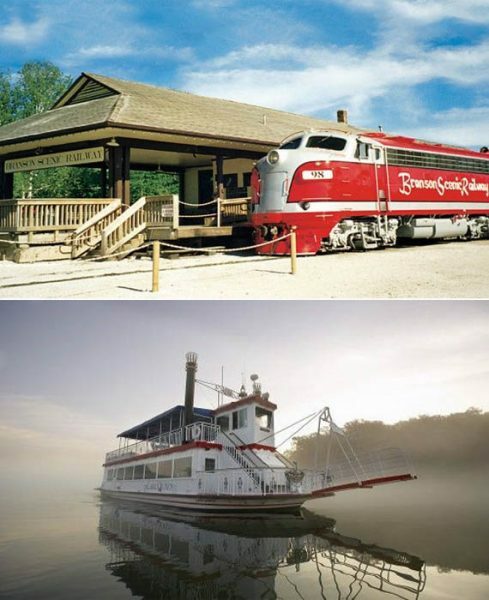 Attraction: Main Street Lake Cruises Lake Queen is a 140 passenger riverboat replica offering a one of a kind sightseeing cruise on Branson’s beautiful Lake Taneycomo. Your well-informed, extensively trained, and certified boat captain guides you safely along the flowing waters of the river-like lake, while sharing stories about the lake, landmarks you’ll encounter along the way, and the wildlife that make their home on this unique lake. You will see birds, water fowel, and other wildlife that abound on Lake Taneycomo and its shoreline; these sightings may include deer, River Otters, the Great Blue Heron, and Bald Eagles, among others. Amazing natural bluffs dating back eons of time, and the spectacular majesty of Ozark vistas, not seen by the vast majority of the millions of visitors who come to Branson each year, will also be seen, along with a view of Branson Landing and its water and fire fountain show that’s as unique as it is beautiful and inspiring. 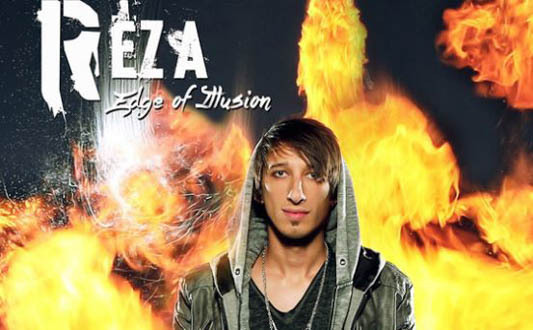 “Reza, Edge of Illusion” gives a fresh cutting edge to magic and illusions. Show: Reza Edge of Illusion will bewitch your sense of reality with unbelievable magic. You’ll see some of “the old-style tricks; the disappearing birds, or the beautiful assistant being sawed in half, but don’t expect the just the predictable . “Reza’s fresh, cutting edge, and out to change the world’s perception of the centuries-old art of magic.” The whole family will be entertained and amazed by this show! Attraction: See the night time lights and splendor of the Branson Strip and surrounding Ozarks from lofty heights of The Branson Ferris Wheel. Chicago’s iconic “Navy Pier Ferris Wheel” now resides at its new home, at Track 4 of The Track Family Fun Parks along with the four story 1,200 foot long “Heavy Metal” Go Kart Track and many other rides and amusements. The Branson Ferris Wheel has 40 gondolas, holds 240 riders, is 150 feet tall, and illuminates the night time Ozark’s sky with “Electify,” a 16,000 LED music and light spectacular. In its 4th smash-hit season, the MILLION DOLLAR QUARTET has been one of Branson’s hottest shows for over three seasons. It’s an incredible musical and entertainment experience based on the Tony Award-winning Broadway musical and the amazing true story of a unique one time recording session that took place in the storefront studio of Sun Records on December 4, 1956. Sam Phillips, the owner of Sun Records and the “Father of Rock ‘n’ Roll,” brought together icons Elvis Presley, Johnny Cash, Jerry Lee Lewis, and Carl Perkins in what turned out to be an impromptu night of unforgettable music. Add great sets, a talented energetic cast, a touch of drama and romance, music that everyone knows and loves, and the result is an unforgettable night of entertainment for the whole family. Amazing Acrobats of Shanghai features acrobatic feats so phenomenal; you won’t believe your eyes! This cast is a troupe of China’s finest and most elegant athletes performing acrobatic feats requiring an amazing array of skills. The stunning costumes, the beautiful backdrops, and an entire theater, custom-designed for the acrobats, from the stage, to the sound to the lighting, provides the perfect showcase for their talents. In our discussion of an ideal family day in Branson we did not mention Branson’s oldest and most popular attraction, the 1880s themed amusement park, Silver Dollar City. 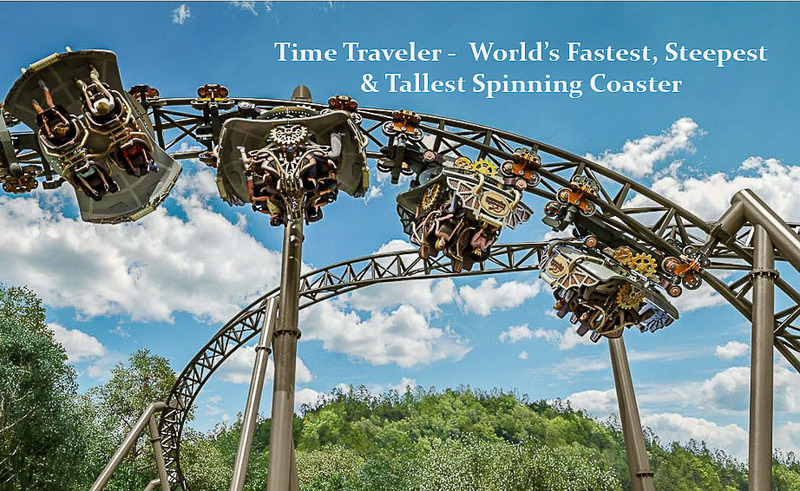 With its combination of more than 40 rides and attractions, its new coaster “Time Traveler,” the world’s tallest, steepest and fastest complete-circuit spinning roller coaster; 100 resident craftsmen; Marvel Cave; shows; and festival related activities; this award winning amusement park is in and of itself the place for an ideal family day in Branson and should not be missed! With all the shows, attractions, free things Branson has to offer there is almost an infinite number of ways to plan an ideal day for your family in Branson. Please feel to contact one of the Branson Tourism Center’s Branson-based Vacation Specialists, who will be delighted to help you plan the ideal Branson vacation, by calling 1-800-785-1550 or through their website www.BransonTourismCenter.com. This entry was posted in Attractions, Branson, Featured, Shows on June 29, 2018 by Gary Groman. “Many think there’s not much to do in Branson during Christmas Week, the week between Christmas and New Year Day,” said Preston Garrison, Director of Operations for the Branson Tourism Center. “Not the case at all. Although many of Branson’s shows are closed, many of its most popular shows are open; as is Silver Dollar City with its Old Time Christmas; and most of Branson’s attractions. From butterflies and tigers, to drive through Christmas lighting displays, acrobats, museums, world class shopping, New Year’s Eve celebrations second to none, and so much more; if you’re looking for excitement, fun, and entertainment during your Christmas vacation then Christmas Week in Branson is the place for you!” he added. 1. Branson Shows – Although many of Branson’s shows are closed for the season, some of Branson’s most popular shows will be open during Branson’s Christmas Week presenting the live entertainment Branson is noted for. This includes, in alphabetical order, The Acrobats of China, Amazing Pets, Clay Cooper’s Country Music Express, Comedy Jamboree, Dixie Stampede, Grand Jubilee, Hamner’s Unbelievable Variety, Million Dollar Quartet, The Haygoods, Hughes Brothers Christmas Show, Legends in Concert, Pierce Arrow, The Miracle of Christmas, and the Showboat Branson Belle, and others. 2. Silver Dollar City’s Old Time Christmas Festival: Silver Dollar City’s Old Time Christmas Festival is one of the Nation’s top Christmas events. Its spectacular display of millions of Christmas lights throughout the park, entertainment, parade, Broadway style shows, and much more has been recognized and featured nationally by USA Today, CNN Travel, The Travel Channel, Good Morning America and many others. 3. Spectacular Christmas Lighting Displays: Although Christmas Day is past, the major drive through Christmas lighting displays will remain open through December 31. This includes the Shepherd of the Hills Trail of Lights, Branson’s Gift of Lights and the giant 30 foot nativity scene on top of Mount Branson overlooking Lake Taneycomo and historic downtown Branson. 4. Branson Attractions – The vast majority of Branson’s attractions will be open. This includes its oldest and most popular paid attraction, the international award winning Silver Dollar City presenting its “Old Time Christmas;” the Titanic Museum Attraction decked out for its beautiful “Edwardian Christmas;” the unique White Flight exhibit at the Butterfly Palace & Rainforest Adventure; National Tiger Sanctuary; Promised Land Zoo and others. 5. Branson Shopping – Branson’s legendary shopping is “always” open and Branson’s Christmas Week is no exception. From the unique “Branson Landing,” with its 100 retail stores, to the shops of Historic Downtown Branson, featuring “Dicks 5 & 10;” outlet malls such as “Tanger Outlet” and “The Meadows” and specialty shops offering arts and crafts and one of a kind items, Branson’s Christmas week shopping should not only satisfy the most avid shopper, but just might have a few “after Christmas sales” to boot. BTC’s Garrison points out that the off season scheduling of shows, limited seating and the fact that some Branson lodging facilities are closed requires some advance planning. He suggests that an easy way to avoid problems, save time and, in many cases money, is by simply calling the Branson Tourism Center, toll free at 1-800-785-1550 and talking with one of their Branson based Travel Planners who will be delighted to answer any questions and assist in making any show or lodging reservations. There is absolutely no charge for this service. This entry was posted in Attractions, Branson, Events, Featured, Shows, Tourism on November 22, 2017 by BTC News Staff. Is Mother Nature’s “Fall Foliage Show” Branson’s greatest show? View from Taney County 165 Lookout looking up Lake Taneycomo toward Table Rock Dam. One of the most common questions we’re asked is, “When does the Fall foliage season start and end?” “It generally starts in the middle of September and peaks during the last two weeks of October,” said Greg Cassell, Research Forester, with the Missouri Department of Conservation. He points out that the leaves will turn and fall during that period, but that their color depends on the type of tree and, most of all, the weather. Cassell feels like the moisture we have been getting throughout the summer is setting the Ozarks up for a great fall foliage season. If that continues through the middle of September, without a lot of persistently hot dry weather, all that’s left is some warm sunny days followed by cool nights to bring out those beautiful fall colors everyone delights in seeing. He said that, assuming Mother Nature cooperates, the colors people will see will vary with the type of trees currently changing color. Typically, the Sassafras, and Sumac are the first to start changing color. They’re followed the Black Gum, Bittersweet, and Dogwood with the Ashes, Oaks, Hickories, and Maples later in the season. He said the best color will be in the older more mature trees with the colors on the Maple being particularly vibrant and beautiful. 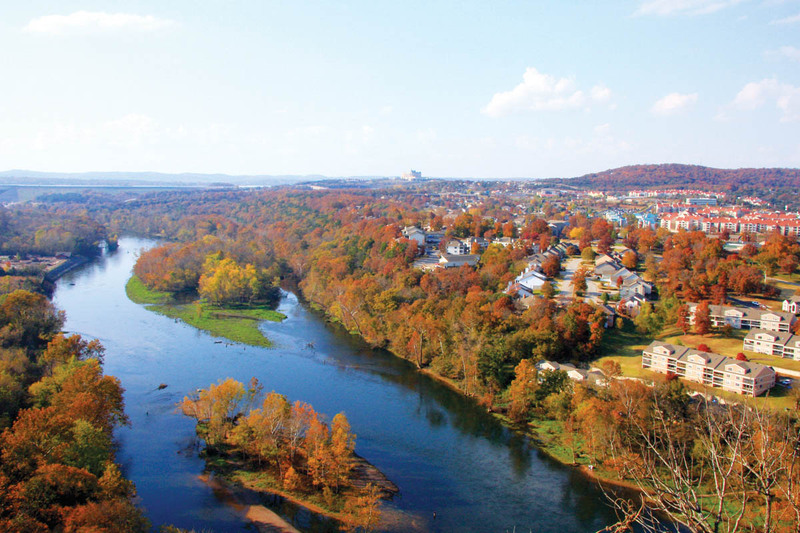 Scenic Lookouts – Many “Scenic Lookouts” provide superb panoramic views of the Ozark’s fall foliage. These include the Lookouts on Taney County Route 165, about a mile south of its intersection with State Route 265; the Table Rock Dam Overlook, located on the south end of Table Rock Dam across the road from the Visitors Center, and the Henning Conservation Area Lookout located about a mile west of the junction of State Route 76 and State Route 376 on the north side of the road. Point Lookout – Located on the campus of the College of the Ozarks on top of a bluff overlooking Lake Taneycomo, “Point Lookout” provides a breath taking and unique view of Branson’s fall foliage with Lake Taneycomo winding through it. It also has a number of mature Maples that are really spectacular. While at the college you might want to plan to eat at the Keeter Center and visit the “Edwards Grist Mill” and the Ralph Foster Museum. Ozark Mountain Highroad – Greg Cassell suggests that the entire length of the Ozark Mountain Highroad, State Route 465, is an excellent way to experience the beauty of our Ozarks’ fall foliage. That experience can be extended if you exit west off the Highroad onto Highway 76, follow it west and turn south onto Highway 265, and follow it across Table Rock Dam to the Table Rock Dam Overlook. Branson Tourism Center’s Garrison also points out that a cruise on the Showboat Branson Belle, on Table Rock Lake, or a ride on the Branson Scenic Railway also provide unique views of Branson’s fall foliage. He says that the fall foliage season, coupled with Silver Dollar City’s National Craft & Cowboy Festival, is a busy time and recommends that advanced reservations be made for shows, attractions and lodging. For more information on the fall foliage in Branson or assistance with information or tickets for any of Branson’s shows and attractions or for lodging arrangements, please contact the Branson Tourism Center by calling 1-800-785-1550 or through its website, www.BransonTourismCenter.com. This entry was posted in Attractions, Branson, Featured, Outdoors on August 16, 2017 by Gary Groman. “One of the greatest joys of July in Branson is to see so many families creating wonderful vacation memories. Branson overflows with the vibrancy of families together, experiencing the unique fun, excitement, and spirit of Branson,” said Annette Wood, Director of Sales and Marketing for the Branson Tourism Center. “From spectacular firework displays, to lakes, over 120 live shows, rides, water parks, golf, and more, there’s just so much to see and do in Branson.” She added. 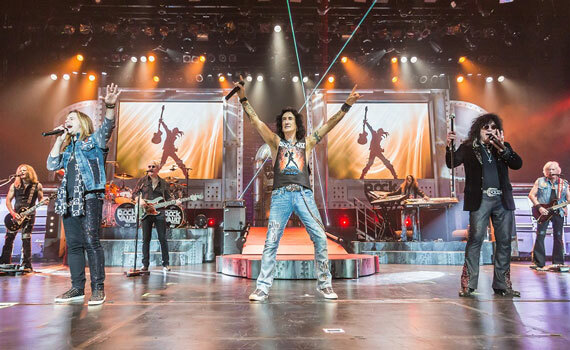 Hit Las Vegas show, “Raiding the Rock Vault,” comes to Branson for a limited engagement. Featured Limited Engagement of the Month: Raiding the Rock Vault goes back in time on a magical musical journey. That journey takes you from 1960 to 1990, with classics from The Rolling Stones, The Who, The Doors, Led Zeppelin, Jimi Hendrix, The Eagles, Queen, AC/DC, Deep Purple, Van Halen, Journey, Heart, Free, Aerosmith and others. Experience history of rock ‘n’ roll as it comes to life in this live rock and roll concert featuring a stunning light show, video screen, dancers and high-quality concert sound production. Featured Event of the Month: Silver Dollar City’s Star-Spangled Summer Festival offers family fun and entertainment you won’t find anywhere else. See the world famous Harlem Globetrotters perform their one of a kind show for their final season at Silver Dollar City, your favorite cartoon characters, Chris Perondi’s Stunt Dog Experience, and much more! And that’s beside everything else Silver Dollar City offers. The 1880s styled them park has over 40 thrilling rides and attractions including “The World’s Most Daring Wood Coaster,” Outlaw Run, demonstrating craftsmen, shows, and other activities. For additional information on these events, Branson’s shows and attractions, or lodging please contact the Branson Tourism Center by visiting www.BransonTourismCenter.com, or calling 1-800-785-1550 and talking with a Branson-based vacation planning specialist. They will be delighted to answer any questions, and assist you with show or lodging reservations and there’s absolutely no charge for this service. This entry was posted in Attractions, Branson, Events, Featured, Shows on June 22, 2017 by Gary Groman. Branson’s lesser known attractions provide big family fun! How neat is it that many of them are unique to Branson! Let’s take a closer look at a few. Main Street Lake Cruises Lake Queen is a modern-day replica of the grand riverboats that once traversed the White River. It offers sightseeing cruises with spectacular panoramas, sights, and a closeness with the beauty, nature and history of the Ozarks that few of the millions of annual visitors to Branson experience. Each cruise is different. You can’t plan for a Bald Eagle to soar overhead or to be sitting in a tree, a mink scurrying along the shoreline, or many of the interesting things that happen daily. They either happen or they don’t but, when they do, you couldn’t have a better seat to see the show! It offers full beverage service and delicious lunch options. Branson Auto & Farm Museum is 90,000 square feet of vintage chrome, modern designs, high performance and legendary styling in the form of 200 classic and collectible cars and trucks. It also has 180 farm tractors, implements, and buggies. What a great way to experience the history of classic and antique cars and farming tractors and equipment in one exciting attraction. Another neat feature is that many of the vehicles on display are also for sale. 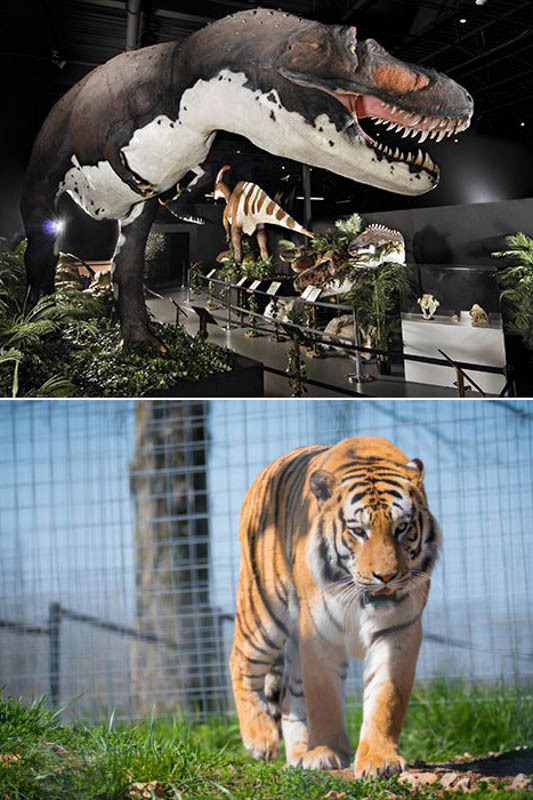 The Branson Dinosaur Museum features a wide variety of enormous animals that once roamed the earth. The life-sized sculptures of these delightfully frightening and lovable creatures, from the “Micro Raptor,” one of the smallest dinosaurs to the two and a half story “T-Rex,” provide an educational and entertaining experience for kids of all ages! Trains, boats, and more, Branson has it all! The Branson Scenic Railway lets you step back in time and experience the beauty of the Ozarks aboard a vintage passenger train! With unique and lovingly restored cars, dating from the late 1930’s to the early 1960’s, tunnels, trestles, and beautiful scenery, there’s no other experience like it in the Ozarks. Branson’s National Tiger Sanctuary is an excellent educational and entertainment experience for young and old alike! The size, strength, and agility of many of the Sanctuary’s big cats will awe you. Their playful antics will amuse you even as the stories of how many came to live in this magnificent haven in the Ozarks touches your heart. For more information on these attractions or other great Branson shows or lodging, please contact the Branson Tourism Center by calling 1-800-785-1550 or through their website www.BransonTourismCenter.com. This entry was posted in Attractions, Featured on June 18, 2017 by Gary Groman. Wouldn’t your family enjoy Memorial Day Weekend in Branson? Silver Dollar City’s “Wildfire”, the Branson Ferris Wheel, Ride the Ducks, and the Million Dollar Quartet are just a few of the many ways to have fun in Branson. “Memorial Day Weekend in Branson is a unique exciting experience,” said Preston Garrison, Director of Operations for the Branson Tourism Center. “Oh, there’s other places with world-class theme parks, natural outdoor beauty, lakes, live shows, and attractions, but there’s few, if any, that have them all so conveniently located. Branson does!” he added. Garrison says that not only is it the first “long summer weekend,” but it’s the “official” beginning of Branson’s summer outdoor season. Its spectacular lakes and natural outdoor beauty are in their full splendor. All Branson’s live shows and attractions are open, and ready to provide its visitors with a special experience not available anywhere else. The proof’s in the pudding! From its oldest and most popular attraction, the 1880s styled Silver Dollar City, to its world-class live shows, and lakeside shopping and entertainment venue, Branson Landing, Branson is unique. What other tourist destination offers everything Branson does? All amid the natural wonder and beauty of a place like the Ozarks, and less than five minutes from a pristine 43,000 acre lake? “Few world-class theme parks in the world have become part of the natural beauty surrounding them,” said Garrison. “Silver Dollar City has!” The view from the top of the loops of its world class coaster “Wildfire” spectacularly illustrates this remarkable achievement. Silver Dollar City’s Bluegrass and BBQ Festival, features over 50 Bluegrass bands and groups. These groups present hundreds of performances throughout the park. Performers appearing over the Memorial Day Weekend include 14-time Grammy Award-winner Ricky Skaggs; Blue Highway; and many more. * The festival’s House of BBQ and Pitmaster’s Court offer a variety of mouthwatering BBQ. There’s demonstrations from grilling experts and an impressive selection of BBQ sauces, and more, to browse. As well as the Festival, Silver Dollar City offers all the shows, rides, craft demonstrations, and more, that makes it one of the top theme parks in the nation. Table Rock Lake offers 43,000 surface acres of potential aquatic fun, excitement, and adventure. Memorial Day Weekend is the unofficial kick off a summer of fun on the lake including sunbathing, swimming, boating, water skiing, scuba diving, and just about any other summer water activity a person would want. “If it’s outdoors, golfing, ziplines, hiking, boating, fishing, biking and more, the chances are that Branson has it,” Branson Tourism Center’s Garrison said. “It’s really neat how all the outdoor activities conveniently combine with Branson’s live shows, attractions, and everything else into a virtually seamless vacation experience. There’s two major firework displays at dusk on Sunday evening, May 28. One is at the Chateau on the Lake, as part of its Memorial Day Celebration, and the other at Big Cedar Lodge, as part of its Patriotic Picnic and Fireworks event. The public is invited to both; with the best views from Table Rock Lake, the property’s grounds or, in the case of the Chateau on the Lake, the peninsula area located just north of the Table Rock Dam to the west of its auxiliary spillways on State Highway 165. Garrison stresses that Memorial Day Weekend is one of Branson’s busiest. He suggests advance reservations to ensure availability of the best lodging and show seating. For more information or tickets for any of Branson’s shows and attractions, or for lodging arrangements, please contact the Branson Tourism Center by either calling their toll-free number 1-800-785-1550 or through their website www.BransonTourismCenter.com. * Schedules subject to change and not all artists are appearing every day. This entry was posted in Attractions, Branson, Featured, Outdoors, Shows on May 15, 2017 by Gary Groman. Castle Rock’s yellow multi-story waterslide and Welk’s Splash-A-Torium. “Winter weather curtails most outdoor swimming and aquatic activities,” said Annette Wood, Director of Sales and Marketing for the Branson Tourism Center (BTC). “However, Branson is blessed with not one, but three indoor water parks as well as many hotels that have heated indoor pools providing Branson visitors with a wide variety of choices to enjoy swimming and aquatic fun under ideal climate controlled conditions,” she added. Welk Resort’s “Splash-A-Torium” is 10,000 square feet of indoor/outdoor water fun featuring “an outrageous 100 foot” plus indoor water slide, kid’s splash-zone, indoor/outdoor pool, and hot tub.” BTC’s Wood points out that the Resort has recently been redecorated and updated with deluxe and premier traditional rooms that include plush amenities, high-end finishes, and a decor reflecting the unique charm of the Ozarks with its vibrant colors and interesting textures. In room amenities include complimentary WiFi, 32-inch LCD widescreen televisions, coffee makers with high quality coffees and teas, high speed wireless internet and many other exceptional features. The Resort even has its own theatre! 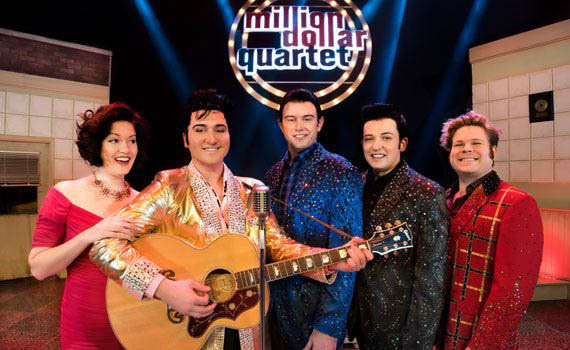 The Welk Resort Theatre is not only home to one of Branson’s most popular new shows, Million Dollar Quartet, but features limited engagement performances by stars such Daniel O’Donnell, Kris Kristofferson and others throughout the year. Castle Rock Resort and Water Park provides “a truly weather-proof vacation destination for the whole family” where they “can splash & play in the climate controlled 84 degree temperature of its indoor water park. Its 40,000 square feet of waterpark wonderland features two 500-gallon tipping buckets, indoor and outdoor kiddie pools, waterfalls, two three-story thrill slides, themed water statues, and a multi-level sun deck. The resort’s water park provides fun for everyone, from tiny tots to adults, as well as tastefully appointed comfortable rooms. Grand Country Inn, has Missouri’s first indoor water park, “Splash Country Indoors.” Open 365 days a year, it offers 20,000 square feet “of squirting, falling and tumbling water fun, including a three-level treehouse with interactive water play features on each level, two winding tube tunnels, a 1,000 gallon tipping bucket which tips every eight minutes, doing you know what to all those below, and much more. The Grand Country Complex, includes the Inn; Grand Country Buffett; The Grand Country Music Hall, home of the Grand Jubilee, Amazing Pets, Comedy Jamboree, Down Home Country, and other great shows; indoor and outdoor mini golf courses, and the Fun Spot Arcade. 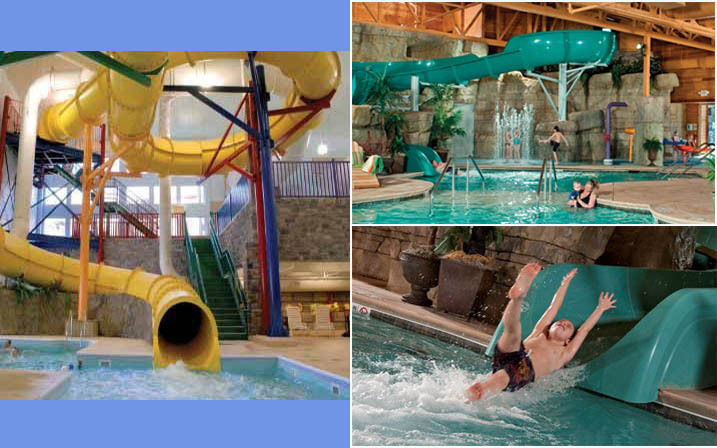 These are the indoor water parks in Branson, but many Branson Hotels and Lodging facilities such as the Barrington Hotel & Suites, Grand Plaza, Honeysuckle Inn and Conference Center, Quality Inn Branson, Quality Inn on the Strip, Radisson Hotel, Residence Inn Marriott, and others have heated indoor pools. In addition, the hotels listed above are participants in Branson Tourism Center’s (BTC) Lowest Rate Lock Guarantee Program. Book your reservation through BTC, and subject to the programs minimal conditions, the price you pay for your lodging is guaranteed to be the lowest rate available. If you find a lower price offered for the same room on the same dates, anytime between when you book your room and when you arrive in Branson, BTC will match the lower rate. BTC’s Wood also points out that during the winter months, especially on the weekends, the demand for rooms at these facilities often outstrips availability. She recommends advance reservations and offers the assistance of one of BTC’s locally based Travel Planners to assist in helping to find the ideal facility to fit your family’s wants and budget and make reservations. There is no charge for this service and they may be reached by calling 1-800-785-1550. This entry was posted in Attractions, Branson, Featured, Hotels, Lodging on January 4, 2017 by Gary Groman. 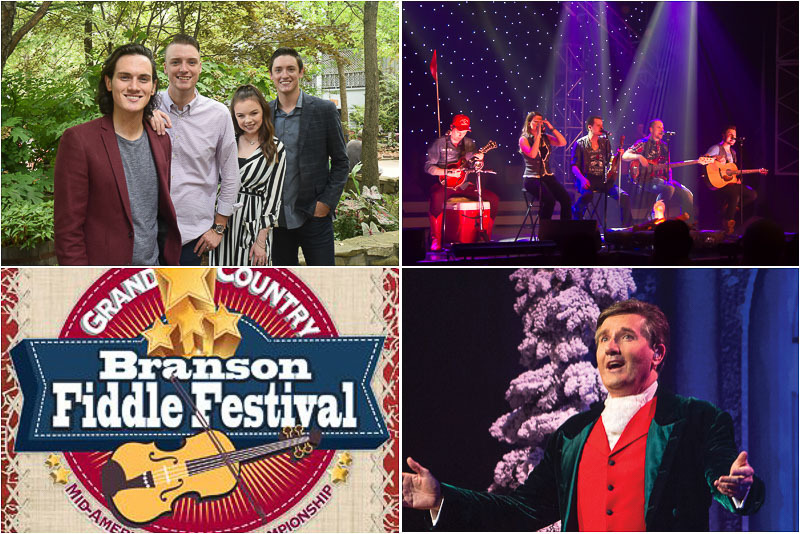 Six awesome reasons why you don’t want to miss Branson’s Christmas Week! 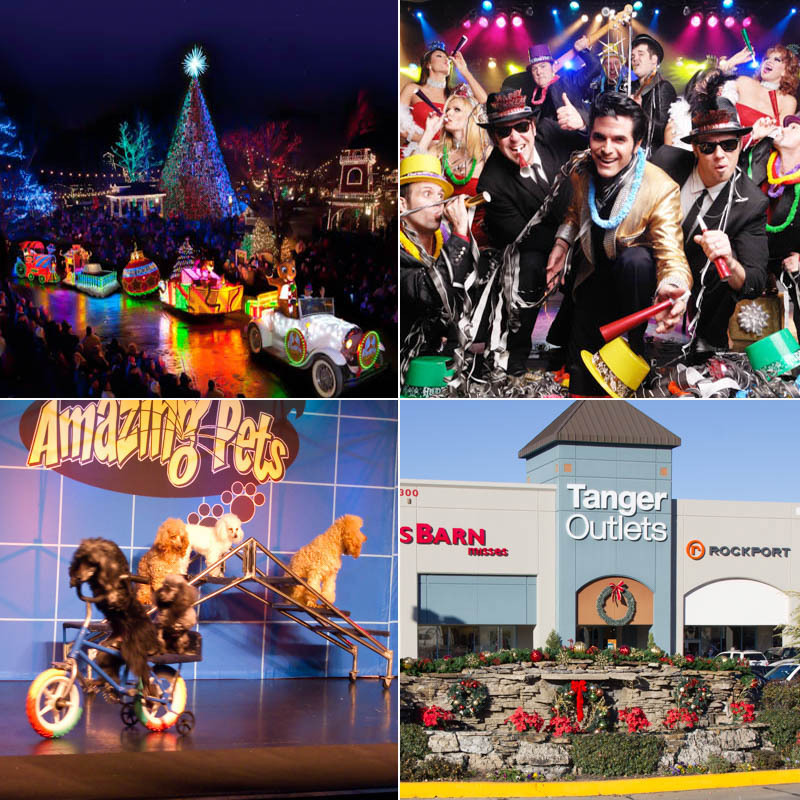 Silver Dollar City’s Old Time Christmas, New Year’s Eve with Legends in Concert, the Amazing Pets Show ,and Tanger Outlets are just a few of the almost infinite choices awaiting Branson visitors during Branson’s Christmas Week. “Branson’s Christmas Week, the week between Christmas and New Year’s Day, offers Branson visitors the same world class shopping and entertainment experience that makes Branson one of the premier vacation destinations in America,” said Preston Garrison, Director of Operations for the Branson Tourism Center. “From tigers and butterflies, to acrobats, drive through Christmas lighting displays, museums, world class shopping, New Year’s Eve celebrations second to none, and so much more; if you’re looking for fun, entertainment, excitement and adventure as part of your Christmas vacation then Branson’s Christmas Week in Branson is the place for you!” he added. 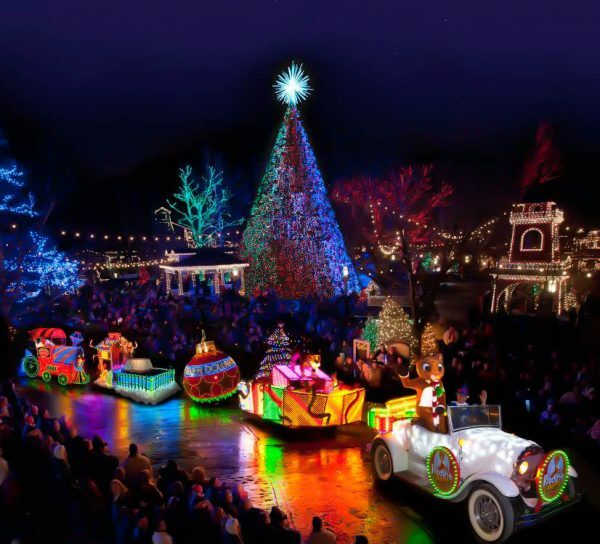 1.Silver Dollar City’s Old Time Christmas Festival: Silver Dollar City’s Old Time Christmas Festival is one of the Nation’s top Christmas events. Its spectacular display of five million Christmas lights throughout the park, entertainment, parade, Broadway style shows, and much more has been recognized and featured nationally by USA Today, CNN Travel, The Travel Channel, Good Morning America and many others. 2. Branson Shows: Although many of Branson’s shows are closed for the season, some of its most popular shows will be open during Branson’s Christmas Week presenting the live entertainment for which Branson is noted. This includes, in alphabetical order, The Acrobats of China, Amazing Pets, Clay Cooper’s Country Music Express, Comedy Jamboree, Dixie Stampede, Grand Jubilee, Hamner’s Unbelievable Variety, The Haygoods, Hughes Brothers Christmas Show, Legends in Concert, Million Dollar Quartet, Moses, Pierce Arrow and the Showboat Branson Belle along with many more. 3. 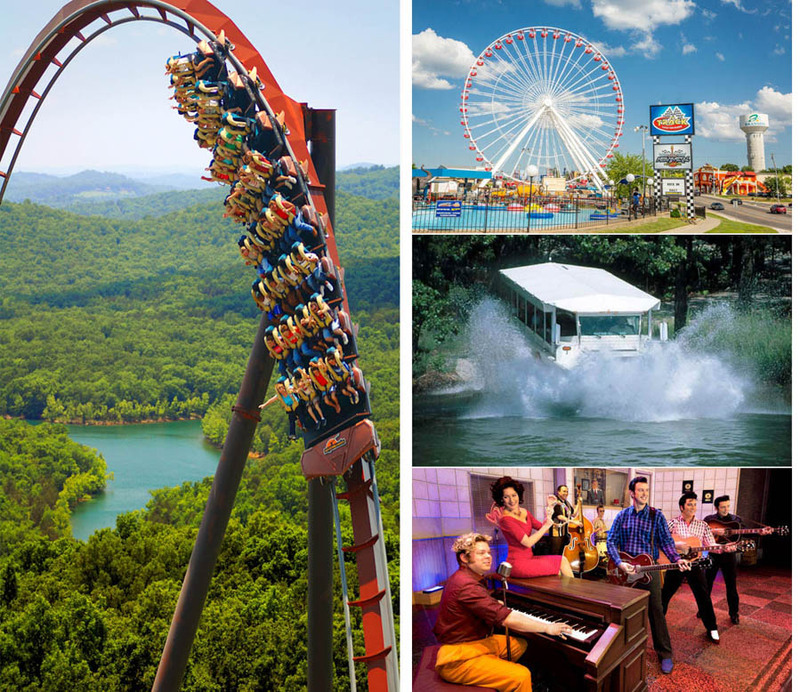 Branson Attractions: In addition to Silver Dollar City, the majority of Branson’s other attractions will be open offering visitors a range of exciting adventures and activities. 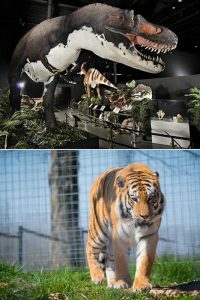 How about an up close encounter with the tigers and other big cats at the National Tiger Sanctuary; a ziplining adventure on Branson Zip Lines, or an entertaining interactive experience aboard Branson’s Titanic Museum attraction. In addition to everything else the Titanic offers its passengers on a daily basis, it’s celebrating its spectacular Christmas and Winter Celebration, as magically, inside and out, the ship “hails the sights, sounds, and joy of the season” and is aglow with glittering lights, festive decorations, and the spirit of the Holidays. And that’s just the beginning! With museums as varied at the Branson Dinosaur Museum and the World Largest Toy Museum, the unique “White Flight” exhibit at the Butterfly Palace & Rainforest Adventure; the Promised Land Zoo, hiking on one of our beautiful Ozark trails, golf, fishing, and so much more, it’s hard to imagine a travel destination, anywhere near Branson’s size that could offer more. 4. Spectacular Christmas Lighting Displays: Although Christmas Day is past, all the major drive through Christmas lighting displays will remain open through December 31. This includes the Shepherd of the Hills Trail of Lights, Ozark Mountain Christmas Lights & Village, Branson’s Gift of Lights and the giant 30 foot nativity scene on top of Mount Branson overlooking Lake Taneycomo and historic downtown Branson. 5. Branson Shopping: Shopping is an important part of the Branson experience and Branson’s Christmas Week is no exception. From the quaint specialty shops offering arts and crafts and one of a kind items; to the shops of Historic Downtown Branson, featuring “Dicks 5 & 10,” the unique “Branson Landing,” with its 100 retail stores, and outlet malls such as “Tanger Outlets” and “The Meadows,” Branson’s Christmas Week shopping will satisfy the most avid shopper. Branson Tourism Center’s Garrison advises advanced planning and reservations for any trip to Branson during the Christmas Season because of the off season scheduling of shows, limited seating, and the fact that some Branson lodging facilities are closed. He suggests that an easy way to avoid problems, save time and, in many cases, money, is by simply calling the Branson Tourism Center, toll free at 1-800-785-1550 and talking with one of their Branson based Travel Planners who will be delighted to answer any questions and assist in making any show or lodging reservations. There is absolutely no charge for this service. This entry was posted in Attractions, Branson, Branson Events, General, Shows on November 28, 2016 by Gary Groman.